Unknown5:00 PM 0 sweets for free! 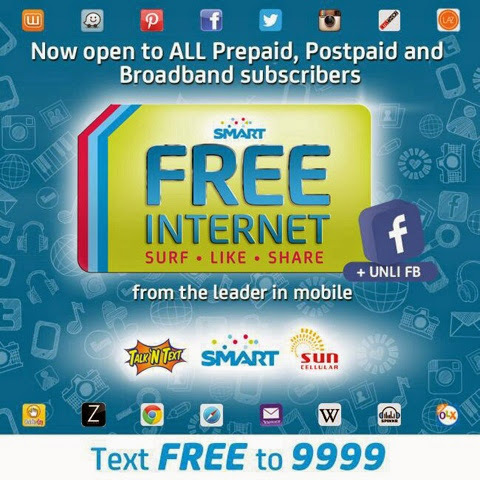 In another unprecedented move, Smart Communications, Inc. (Smart) and Sun Cellular announced that effective October 3, it is expanding their free Internet offer to all of their prepaid subscribers to also cover all their postpaid and broadband subscribers. Furthermore, they are extending the duration of the free mobile Internet promo across all subscribers – postpaid, prepaid and broadband -- fromNovember 30 through the Christmas season until January 5, 2014. "With millions of subscribers going online, our network has been performing very well, enabling them to sign-up for the service to take advantage of the free Internet offer ." said Roland G. Pena, Smart Technology Group Head. Last Wednesday, PLDT also announced that it is boosting the capacity of its 90,000-kilometer domestic fiber optic network by 520 gigabits per second under a P544-million expansion project that will be completed by the first quarter of 2015. This will raise the total capacity of PLDT’s DFON by 13 percent to 4.6 terabits per second.